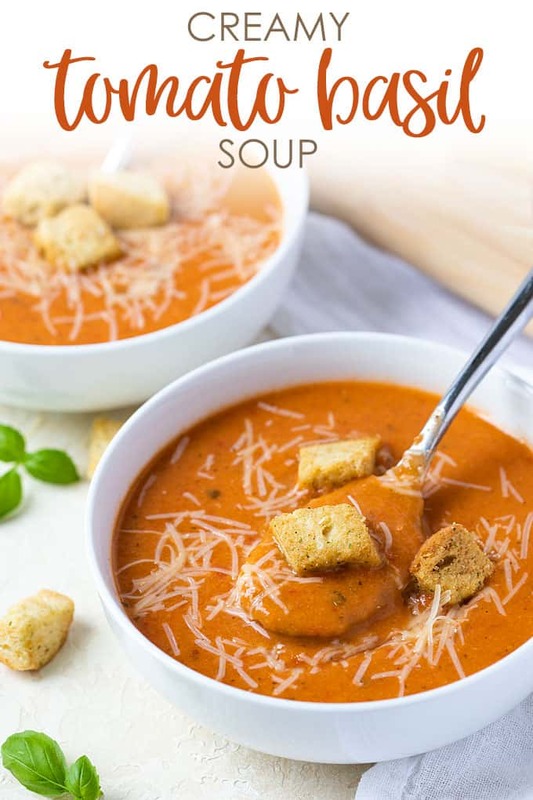 So savory, rich and comforting… this Creamy Tomato Basil Soup is comfort food at its finest! 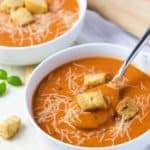 I love a good hot bowl of soup any time of the year, but there’s something about this tomato soup that I especially crave when I’m feeling under the weather. It just warms my soul! Have I mentioned how awesome it smells while simmering?! This is an older recipe on the blog that I brought back with new photos. I haven’t made this soup in a while… I took a taste while it was simmering and just had to give it some new glory. 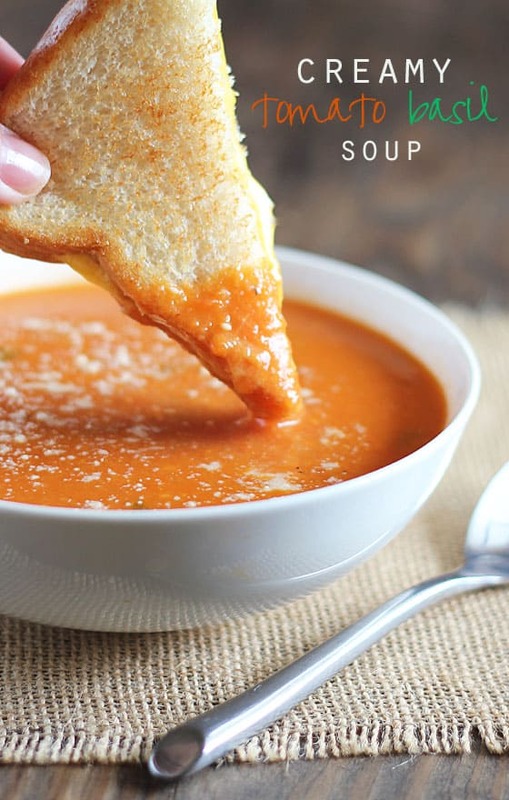 Not only is this soup incredibly delicious, it’s so EASY to prepare. 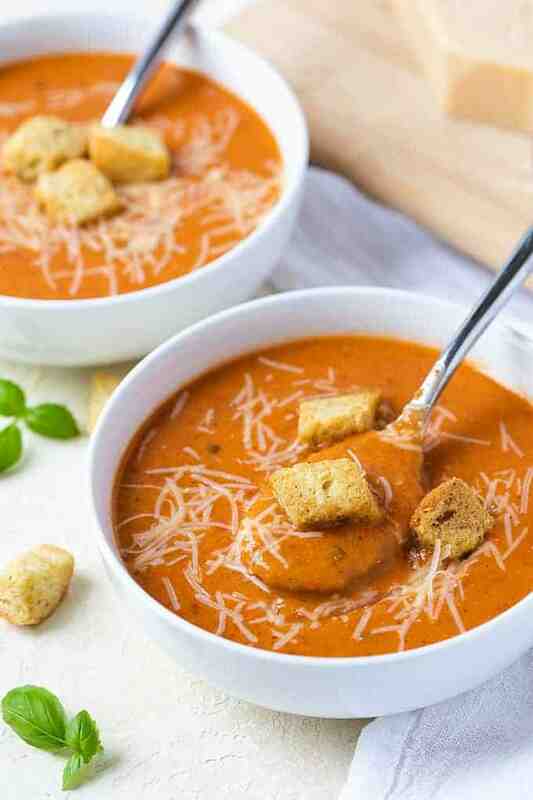 Top it off with Parmesan cheese and croutons for added flavor and texture (sooooo good!). 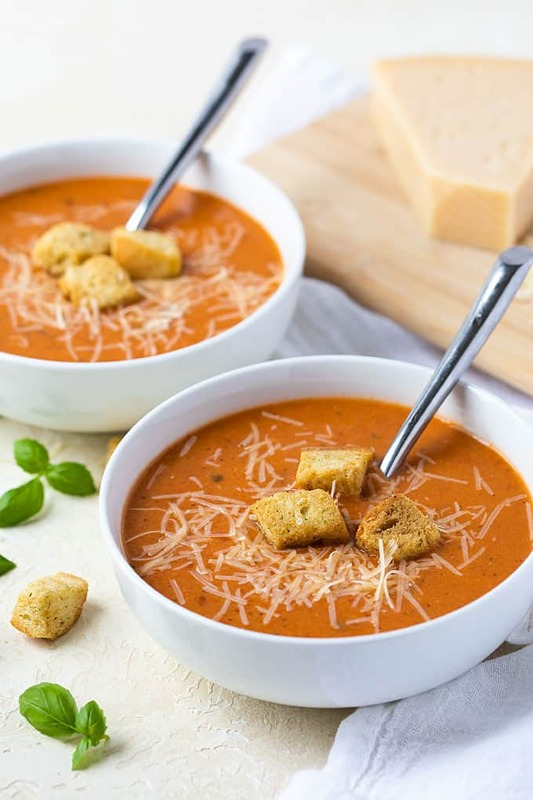 Restaurant-style tomato soup has never been easier! Originally published April 8, 2014 and updated October 15, 2018. Heat olive oil in a dutch oven or large soup pot over medium heat. Add chopped onions and cook until soft and just beginning to brown (about 8 minutes), stirring frequently. Add minced garlic, stirring until fragrant (about 30 seconds). Add tomatoes, juice, chicken stock, sugar, bread crumbs and pepper. Stir to combine. Bring to a gentle boil. Reduce heat, cover and simmer for 20 minutes, stirring occasionally. Remove from heat. Using an immersion blender, carefully puree tomato mixture. 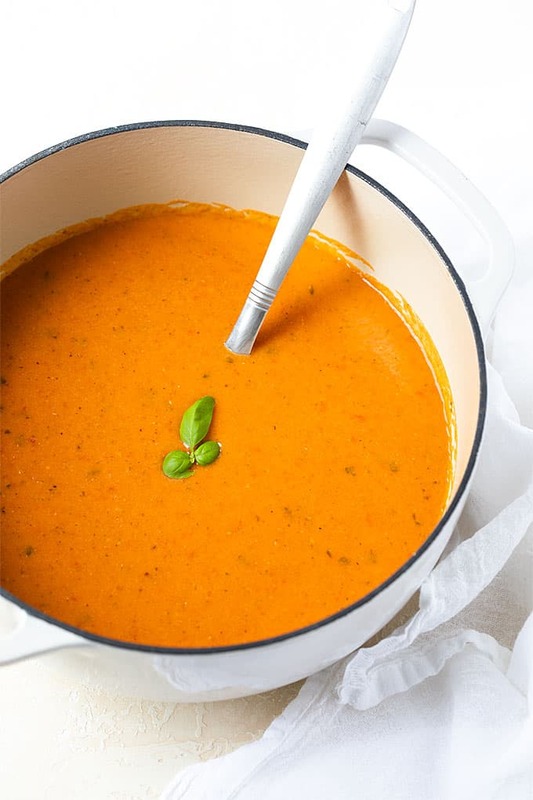 If you don’t have an immersion blender, place in a regular blender in small batches (exercise caution while blending hot liquids – blend small amounts at a time and hold down the top of blender pitcher while blending because there is a risk of the top blowing off and hot liquids to blow out!) and return to pot and stir well. Return to oven burner over medium heat. Add milk and basil. Stir to combine. Simmer (covered) for an additional 15 minutes, stirring occasionally. Top with shredded or grated Parmesan cheese and/or croutons. Just made this amazing soup. So easy and perfect for a rainy Halloween night. It’s just 2 of us here and I’m wondering if I can freeze the remaining soup since it has milk in it. Thanks Kelley, glad you enjoyed it! 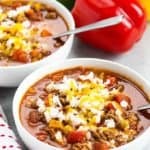 I’ve never frozen this soup so I can’t say if it would be good thawed and re-heated. 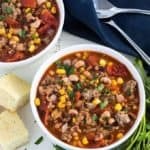 Loved this delicious soup! It was perfect for tonight’s blizzard! Made this soup today. Can’t believe how easy and tasty it came out. 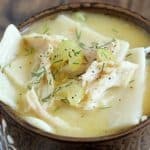 I’m a soup lover on a cold winter or fall day! Will be making it again !! Thank you so much, Michelle! 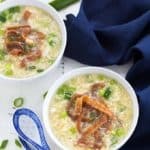 It is one of my favorite soups. I am glad you enjoyed it! Great recipe, thank you! I used panko instead of bread crumbs for thickening and added some Italian spices. Thanks, Shirley! Glad you enjoyed it. For a thicker consistency. Hope you enjoy it if you make it! Great recipe. 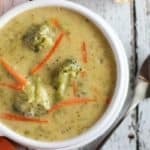 I use coconut milk and vegetable broth to make it vegetarian and gluten free. Always a hit! 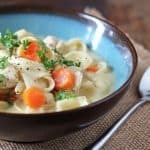 I love this recipe and have made it a lot. My kids love it so much, and I would like to can it. Has anyone canned this soup without the milk? Wondering how long to process.